The ERA body supplied to special order by M&E must be the most detailed ever for a commercial tethered car, correct even to the manufacturers badge above the radiator grill. The dummy exhaust has a minutely perforated heat shield as on the original, whilst the myriad of punched and hand cut louvres almost defies description. That each of these bodies was carved by hand from solid pine is even more amazing. 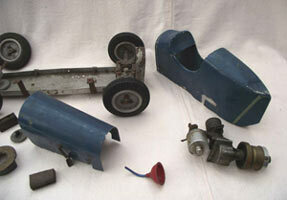 The ERA bodies discovered now heavily outnumber the scale Austin GP, of which there are still only two known to exist. Chassis number for this car is 1468, while the body number is 18, but with additional initials of DG. 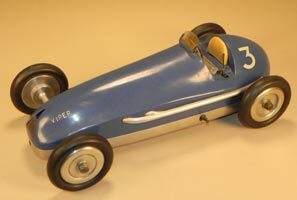 Jack Cook, another Sunderland Club member, was at the forefront of British tethered car racing through to the late 1950s, breaking records and winning the European Championship along the way in the 5 and 10cc class using Dooling motors. 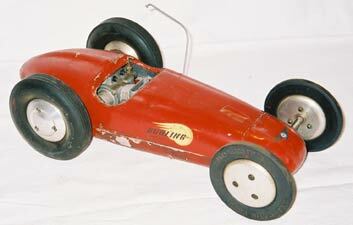 The 5cc cars were all home built and numbered, 6,7,8 and 9 his record breaker. The number 6 leads us to believe this to to be one of the earlier versions, which probably had a magneto at some stage, hence the cam arrangement on the axle. The provenance of these two cars has only been established in the last two weeks. 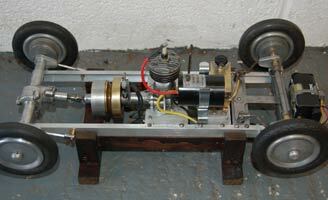 This is one of three cars built by Ken Procter from Sunderland and described in contemporary magazines. Ken, along with Jack Cook and Jim Dean were amongst the last British competitors in Europe in the late 1950s. By then, most people had moved away from the Oliver twinshaft preferring to use a conventional Tiger motor on a spur mount, which allowed a more useable range of tyre sizes. 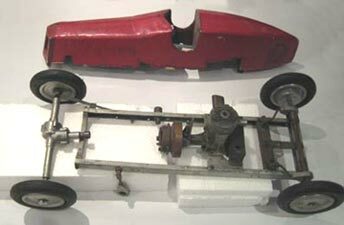 The 'Berreta Rosso' (Red Top) was fully described in Model Maker late in 1957, one of the very last tethered cars to appear in that magazine. It would be interesting to know just how many thousands of kits and parts for the MRC were produced? There is still reckoned to be a hoard of parts down in Kent and items keep popping up like the two shoe clutch on ebay in June. This example has the cranked rear radius arms and the later three shoe centrifugal clutch on the Falcon motor. Could this be a genuine 1066 fuel tank behind the motor? The home built body and the chassis are now undergoing restoration and the owner is actively searching for the missing parts. This is probably the most common of the British commercial tethered cars, but what is relatively rare is the 1066 Hawk motor as can be appreciated by its serial number 32. This is the earlier version of the chassis with the cranked rear radius arms but with the engine located further back to accommodate the later three-shoe clutch. The car has been superbly restored by its owner, whilst the Hawk has received some expert attention from Mike Crisp in deepest Suffolk. Yet to see an original tank or battery box as shown in the catalogue though? 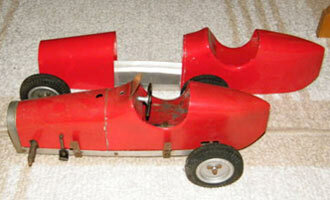 This unremarkable home built car came up for auction in deepest Suffolk last month. 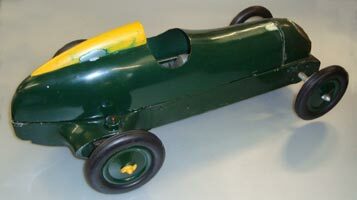 With its ED Racer motor, ED Speedicord tyres and a very crude bent aluminium chassis, the estimate of £200-£300 was about right. It doesn't seem to have run as the twin exhaust stacks are hard up against the body shell. No the photo is not the wrong way round either, the builder put his numbers on back to front. Oh yes, the hammer price £1,000, yes that's right, £1200 with premium??? Paul Zere of ZN Motors in Hendon was one of the few people producing cars and components commercially for the 5 and 10cc class, which he continued through to the end of the sport. 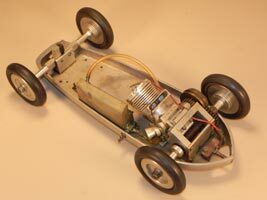 The 5cc car was based on a pressed aluminium pan and body with a spur drive mounted motor, usually a Dooling 29. Zere had intended to produce his own motors, but this was scuppered by the imposition of purchase tax. This rare example has a mixture of wheels rather than the correct ZN items and since this photo was taken has been restored and left for the US. Another example of Mr Knowles' once rare Maseratis. The Retro Club magazine featured an extensive article trying to identify which prototype this was actually modelled on, and given that most of the cars of the period featured massive engines in the front and the driver at the back, the most likely would seem to be the Bi-Motore. This would account for the 'driver' being in the middle as there was another engine in the tail section. 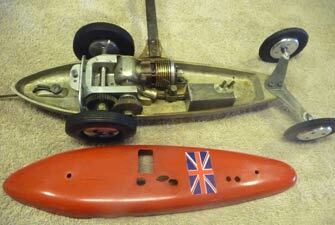 This lovely example is missing its motor and accessories, but is in otherwise 'sparkling' condition. This pristine example of an Oliver Mercedes was purchased many years ago from someone connected with the Ossett track in Yorkshire. 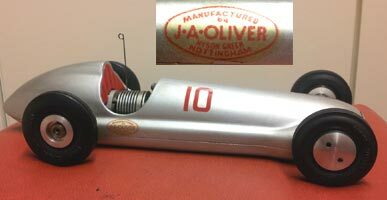 Apart from the superb condition of the car, the transfer is of significance as it bears the name Hyson Green, which John Oliver recalls was the area of Nottingham where they had several cycle shops. The transfer would have been used on the cycles they sold rather than carrying the Radford Road address more normally associated with the cars and engines. A fine piece of engineering. All the parts of this car, including the two-piece cast body are commercial but we cannot find any references to what it might be. All the running gear is from J.S. Wreford of Romford, and we wonder whether this was a replacement for the earlier Half Pint which was all made from pressed sheet aluminium? 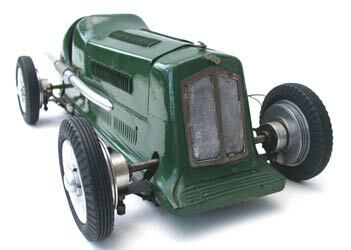 What cannot be seen is the front axle which allows the steering to be adjusted. The motor is an Allbon. What is unusual about this otherwise standard M&E Special is the serial number 1003, making it one of the very first production models in 1947. It is not entirely complete, missing bridles, the coil and condenser bracket and the knock-off, but what is there is absolutely original and genuine M&E, including the twin feed tank, which is rare. Also unusual is the full compliment of body clips, springs and brass studs. The body is numbered 12, which we still do not understand the full significance of. Pulse jets (and later, turbines) remain banned for cars and hydros, although, as seen previously, it does not stop people building and running them privately. 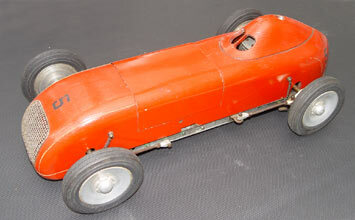 This car from the collection of the late Gerry Buck has a simple plate chassis, ZN wheels and a 1066 body barely containing the Juggernaught jet. Whether it was ever fired in anger or run is unknown at present, but it would certainly be impressive, as anyone being near a pulse jet when running would confirm. 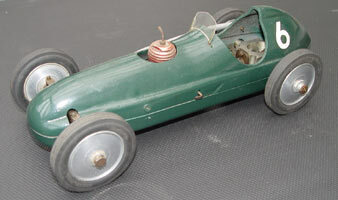 The Wasp was the smaller C class car produced by M&E Models of Exmouth. 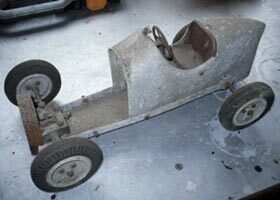 On the left is a true 'Barn Find' that is awaiting restoration, while in the centre eBay listing there was the bonus of an original and undrilled chassis as well as two new body sections. The version on the right is the most complete, including a 'Penny Slot' ED and original M&E Wasp clutch. Further details of all M&E cars are available on the M&E page. Quite a bit of 1066 influence here with original chassis, gearbox, wheels tyres and rear suspension. 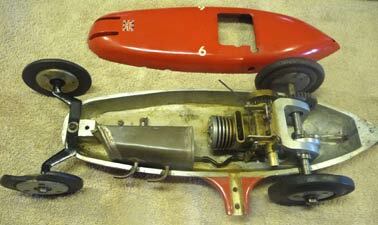 The steering has been abandoned and front suspension has been re-engineered, but the intriguing feature is the use of a Westbury Kestrel motor with a magneto driven from the rear of the crank. The Kestrel is unusual in having the rotary disc running on the front face of the crankcase making this conversion somewhat easier. The simple body is very effective and is another example of early British tethered cars from Ron's extensive collection.